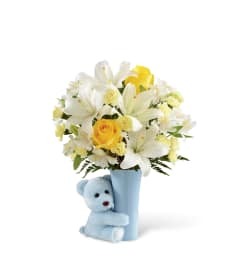 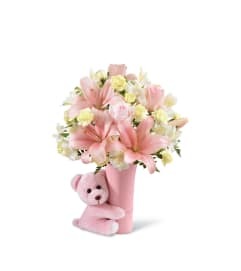 The FTD® Sweet Baby Boy™ Bouquet by Hallmark celebrates the new family with style and grace. Blossoming with light and love, this fresh flower bouquet brings together white roses, carnations, gerbera daisies, mini carnations, Asiatic Lilies, and dusty miller stems to create a truly stunning gift. 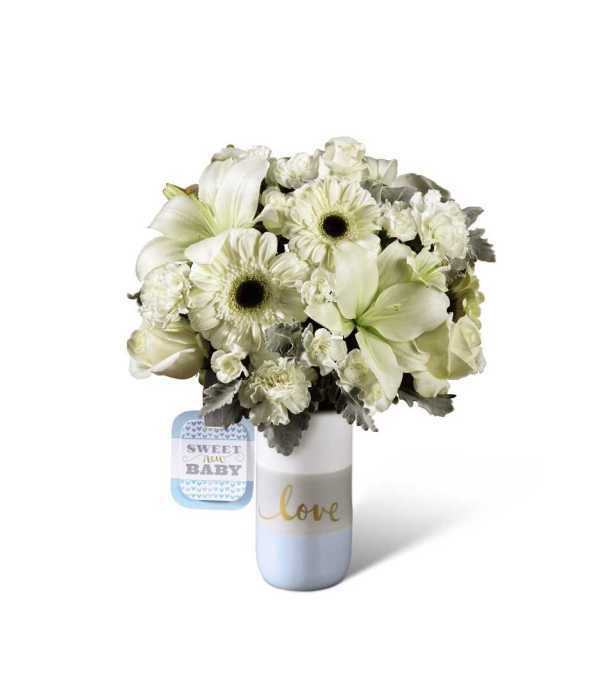 Presented in a keepsake ceramic vase with a pale shade of blue at the bottom, "Love" written in a metallic script font at the dusty gray center, and white on the top, this beautiful bouquet arrives with an exclusive Hallmark tag that reads, "Sweet New Baby," making this a wonderful way to welcome the new baby boy into the world.